Weeds cost farmers billions of dollars every year. They compete with crops, harm livestock and contaminate produce. And it is a problem that’s only getting harder to solve, with some weeds becoming resistant to commonly used herbicides. Now an invention by a creative Western Australian farmer could prove to be a crucial part of the global solution. Grain grower Ray Harrington first had the idea for the Harrington Seed Destructor 22 years ago. After investigating everything from cooking to cremating to catching weed seeds, he decided the most efficient method would be to crush the weeds. The Harrington Seed Destructor was developed in 2006 as a machine that was towed behind a combine harvester. It featured a high-speed cage mill originally developed in the mining industry over 100 years ago, which catches the chaff (comprising mainly of grain husks and weed seeds) and smashes the seeds to a powder. Australia’s Grains Research and Development Corporation (GRDC) saw the potential of the Harrington Seed Destructor, and knew what it could mean for grain growers, so they funded research and development to prove the concept, acquire the rights, and develop it for commercialisation. The machine can now be retro-fitted into modern grain harvesters. Its rotating metal blades smash the weed seeds and rendered them unviable, and this is spread immediately back over the paddocks. 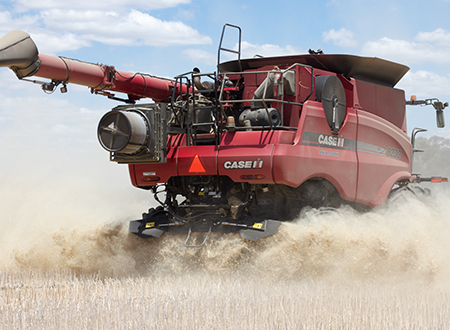 This allows growers to retain valuable organic matter, unlike another popular solution for weed seed management, the chaff cart, which catches the chaff for disposal. Research conducted with the Australian Herbicide Resistance Initiative (AHRI) found that the integrated model destroys up to 98 per cent of seeds – up from 95 per cent from the original model. In 2016, De Bruin Engineering was awarded the contract to manufacture the integrated machines and has built more than 70 units that will be in use during the 2017 harvest season, and a number of which are being exported for use in international trials. Thanks to impressive results, this innovative, non-chemical weed control technology is attracting the attention of growers and agricultural associations around the world, and will export production from 2018. Harrington is quick to point out, however, that rather than being a “silver bullet”, the Destructor is most effective when used as part of a broader weed management strategy. According to the Grains Research and Development Corporation, weeds cost Australian grain growers $2.6 billion a year in weed management activities and $708 million in produce loss. And these costs are passed on to consumers through higher prices in our supermarkets and greengrocers. In the US, a recent study by the Weed Science Society of America found that if weeds were left to grow uncontrolled in corn and soybean fields across North America, about half of these crops would be lost, costing US and Canadian growers around US$43 billion annually. Herbicide-resistant weeds are a major problem in that part of the world, and farmers are struggling to find effective solutions. Similar battles are happening in the UK. According to the UK’s Food and Environment Research Agency, the average winter wheat crop is treated 2.5 times with herbicides. But it’s an approach that is no longer working and growers are increasingly looking for non-chemical methods to control weeds. Globally, Australia is leading the charge in this war on weeds thanks mainly to a system developed in Western Australia called harvest weed seed control (HWSC). This involves targeting weed seeds during harvest to minimise the seed bank, rather than relying on herbicides to kill weeds during the growing season. HWSC has become widely adopted domestically, with Australians inventing many of the HWSC techniques – including the Harrington Seed Destructor. The technology has been vertified by the Australian Herbicide Resistance Initiative at the University of Western Australia, led by Professor Stephen Powles and Dr Michael Walsh. With its potential to change the game – one that farmers have long been losing – the integrated model is now in high demand. It’s being exported to agriculture customers in the US, Canada, UK, South America and Israel. Harrington has worked the land in Western Australia since 1963. His two brothers also run farming operations. Together the three have invented 15 products on the market. These include a machine that treats sheep with a chemical that repels blow flies. The brothers also developed a range of sheep handling equipment to improve efficiencies, enabling farmers to handle more sheep per man unit on their properties. But the seed destructor was Harrington’s very own labour of love. Harrington has been using the seed destructor on his farm for seven years, and is now on the cusp of removing one herbicide. Using an integrated weed management system, including the Harrington Seed Destructor, he has managed to crash the radish plant numbers – one of his problem weeds. To anyone not in the agriculture business this might not seem like very big news, but for Harrington, and farmers around the world, it’s hugely significant. “I was trying to shift a mob of sheep out of the crop earlier, and for the whole time I was driving I couldn’t see one radish plant,” he says. Learn more about Harrington Seed Destructor.